Google has announced that it has signed a 20-year deal to power some of its data centres with the wind. The internet giant has signed a Power Purchase Agreement that will see them begin to pay for power generated by the wind, as Google attempts to assuage fears that its data centres are a major contributor to global warming. "When we decided in 2007 to voluntarily become carbon neutral, our intent was to take responsibility for our carbon emissions and promote sustainable environmental solutions. We approach this goal in three ways," blogged Google's Donald Melanson. "First, we minimize our energy consumption; in fact, we've built some of the world's most energy efficient data centres," he added. "Second, we seek to power our facilities with renewable energy, like we did in Mountain View, CA with one of the largest corporate solar installations. Finally, we purchase carbon offsets for the emissions we cannot directly eliminate. "We just completed a substantial 20-year green Power Purchase Agreement that allows us to take responsibility for our footprint and foster true growth in the renewable energy sector. 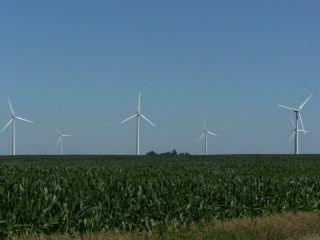 "On July 30 we will begin purchasing the clean energy from 114 megawatts of wind generation at the NextEra Energy Resources Story County II facility in Iowa at a predetermined rate for 20 years. Incorporating such a large amount of wind power into our portfolio is tricky, but this power is enough to supply several data centres." "We depend upon large quantities of electricity to power Google services and want to make large actions to support renewable energy," added Melanson. "As we continue operating with the most energy efficient data centres andworking to be carbon neutral, we're happy to also be directly purchasing energy from renewable resources."